The last time Barack Obama visited Kenya, he was a freshman Democratic Party senator from Illinois and putative global superstar – considering a stab at the United States presidency. On that occasion, he simultaneously enraged Kenya’s political authorities and endeared himself to many ordinary Kenyans during a lecture at Nairobi University where he described systemic corruption as “a crisis that’s robbing an honest people of the opportunities they have fought for”. The government was quick to dismiss Obama as “immature” and an opposition “puppet”. Perceptions that Mwai Kibaki had stolen a second term – coupled with persistent corruption allegations, and domestic US concerns – rendered a first term visit impossible. The violence also resulted in indictments from the International Criminal Court (ICC) – two of which were for Uhuru Kenyatta and William Ruto, the pair who were to take over power from Kibaki in April 2013 – just months after Obama’s own election for a second term. The Kenyatta administration also began to talk up its pivot away from Kenya’s traditional partners in the West and towards China as a potential patron. Obama then snubbed Kenya during his three-nation Africa tour in June and July 2013. In fact, a handshake between the two at Nelson Mandela’s 2013 memorial service was the closest Kenyatta had gotten to formal Western acknowledgement that year. 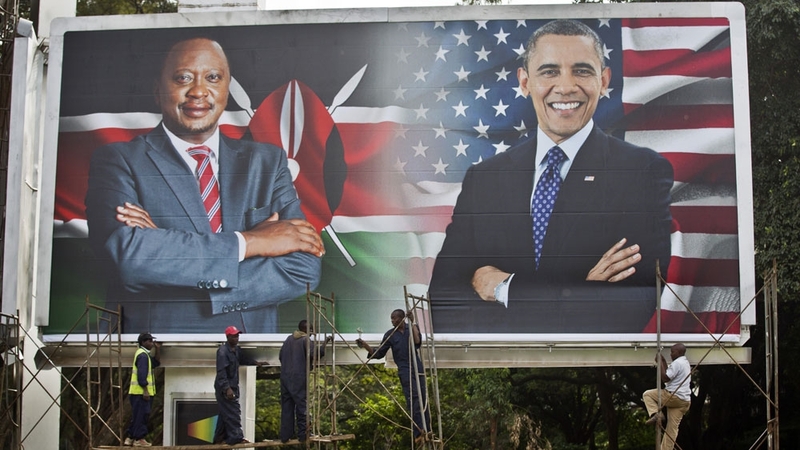 The next year would begin on a more positive note – when Kenyatta was invited to the US-Africa Summit in August 2014. Though nearly every other African president was invited, this did not stop Kenyatta’s team from taking full advantage of the situation. The invitation to the summit was painted as an indication of Western reconciliation – even though the White House had said there would be no private meetings, the inevitable photo of the Obamas and Kenyattas was widely circulated in the local Kenyan press and on Twitter. Further, the fact that no sitting US president has ever paid a visit to Kenya dented the nation’s self-image as the linchpin in the region. Previous visits by Bill Clinton and George W Bush to neighbouring Tanzania and Uganda, as well as Obama’s trip to Tanzania in 2013, served to rub salt in Kenya’s festering wound of irrelevance. By securing this visit, Kenyatta can validly claim to have gone some way towards fixing this and rehabilitating Kenya’s image abroad. While in 2006, he was largely (and mistakenly) seen as a Kenyan making waves in the US political sphere, and later as “our man” or Africa’s representative in the White House – perceptions of him, and his “Kenyanness” have changed quite radically since then. Thus this visit will be less a homecoming and more a visit from the head of the world’s most powerful state.